3. Owners do not know how to screen potential buyers. FSBOs often have no idea about the difference between prequalification and preapproval, and they don’t know that buyers should ideally be preapproved or at least prequalified. 4. Owners fail to solve buyer’s queries. Handling inquiries from buyers on their listings and coordinating showings for their homes are prerequisites for making a sale. However, many homeowners either aren’t able to handle such inquiries on their homes or don’t have the time for them. 5. Owners don’t understand the concept of ‘golden time’. According to this concept, homeowners get the most money for their homes in the first week of putting the property on the market. The longer FSBO homes stay on the market, the less money people will be willing to offer for them. 6. Owners fail to understand the contract procedures. The contract to buy a home involves much more than just the price offered by the buyer. Also, real estate contracts have lots of timelines and clauses and involve several common contract contingencies, such as inspections and mortgages. 7. FSBOs don’t know how to handle the home inspection findings. Home inspections almost always find some issues with houses even when they are relatively newer structures. In such cases, the buyer requests problems be fixed or corrected before moving forward with the transaction. 8. FSBOs incorrectly price their homes. 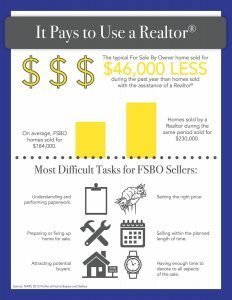 FSBOs often price their homes incorrectly due to lack of experience. They set the price too high, which hinders their chances of closing the deal. 9. FSBO homes lack exposure. Homes for sale by owners are often listed on a few websites, but there are many that don’t allow FSBOs to list their property. Thus, FSBOs are unable to give their homes adequate exposure in the market.